Hopping on a Dublin Bus today? 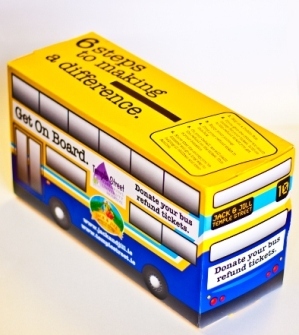 Donate your bus refund ticket and see all donations go to The Jack & Jill Children’s Foundation and Temple Street Children’s University Hospital. We will claim the refund on the ticket on your behalf. Your ticket donations will go a long way in helping very ill children and their families. How can you send us your tickets? If you’d like us to send you a Bus Refund Ticket Box to place on your company reception desk, please fill in the request form attached. You’ll be amazed at the number of refund tickets you’ll be able to collect.